Vendio has partnered with industry leader, Terapeak, to provide you with great eBay selling research, education, and insights. If you've ever wanted to know what a product is worth or how to sell profitably on eBay, then try Terapeak today. 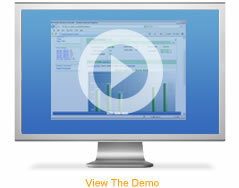 In fact, Terapeak users make, on average 65% more per sale! Discover any product's eBay value, and how to price it Unfortunately, what a seller thinks a product is worth, isn't always what buyers will pay. Terapeak searches all of eBay's sold listings and in seconds provides the highest, lowest, and average sold prices for any product so you can list smarter, know how much you'll sell for before you list, and know whether you'll sell for the price you want. 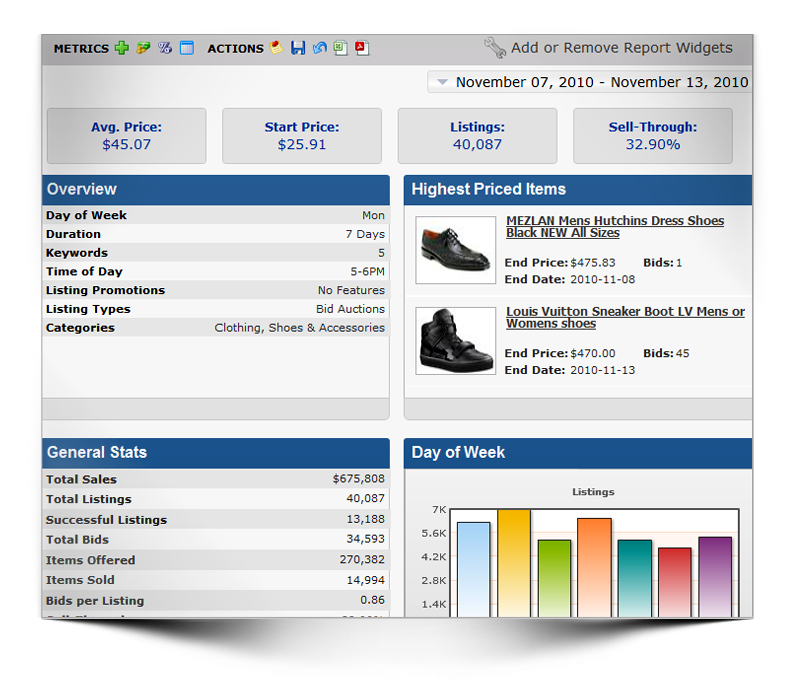 Review the sales and listing strategies of a specific seller or find the top sellers in your category. 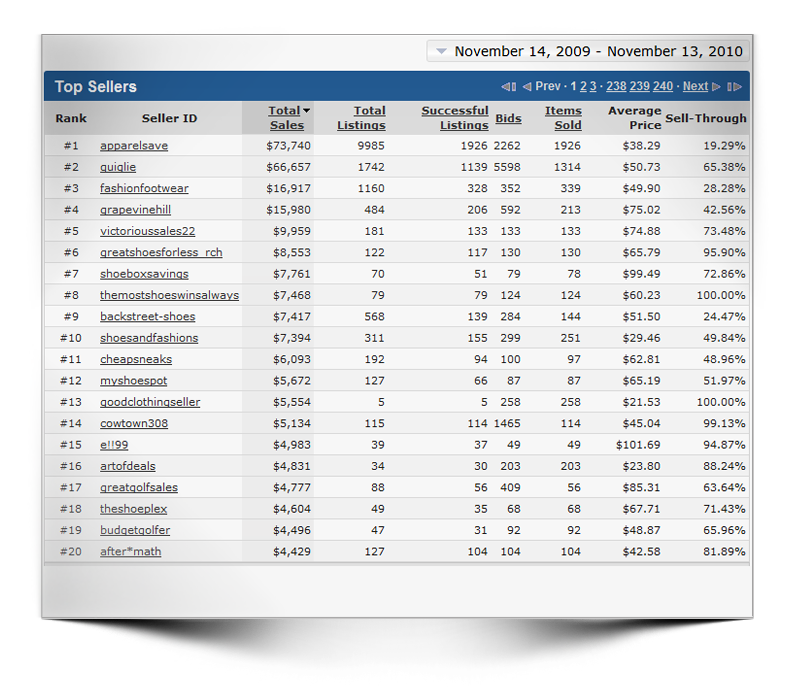 Search by individual seller (or let Terapeak find them) and see how well top sellers are doing, which products are the most popular, and which techniques top sellers use to stay successful. 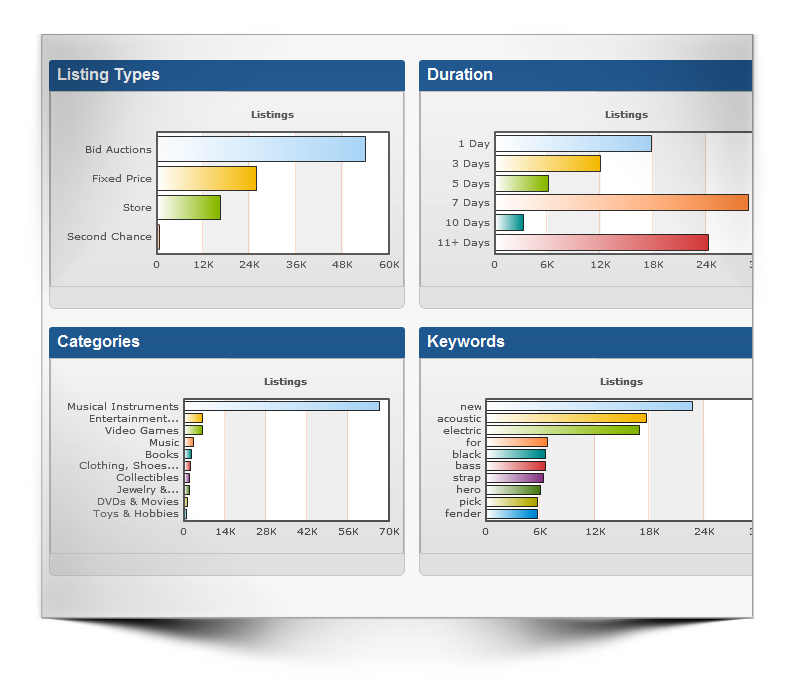 A keyword search is usually the first search a buyer uses to find what they need on eBay. 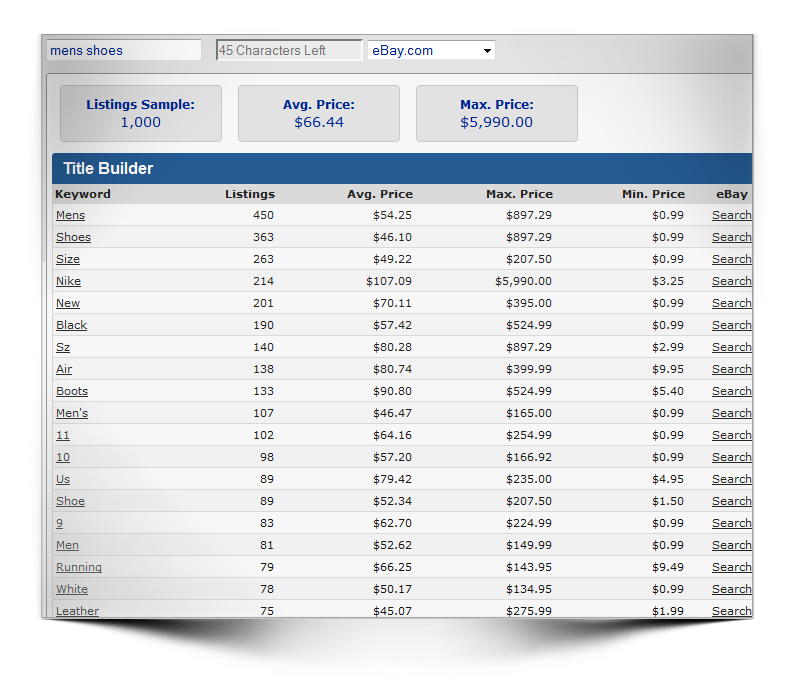 Terapeak Title Builder literally tells you what words to use in your title based on which keywords get the highest final values, the best sell through rates, and the most profitable keywords. Find the best listing format, options, and features for any product Someone who buys baseball cards is much different than the person who buys engine parts. They are searching eBay at different times, respond to different features, and prefer auctions over fixed priced. 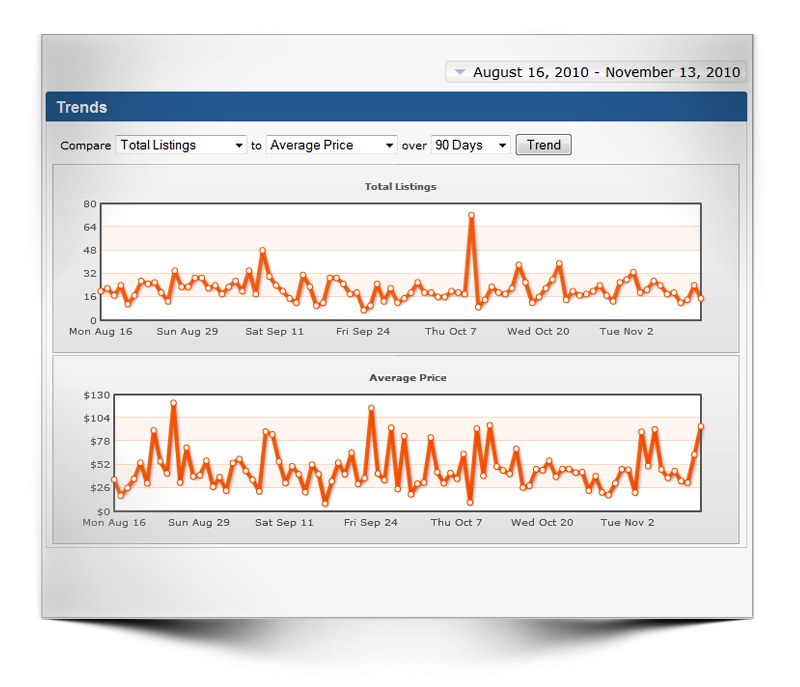 Terapeak shows you exactly what elements to include in your listing such as the best times to list and sell and the most successful listing techniques to use. Spot trending products with one click and assess if your products are hot within seconds. Find inventory you know will sell and expand your business by selling new products that are proven to be profitable. See the products that sell most often, have the best sell-through rate, and are most in demand.